Anna Christiansen's small-town life is about to go haywire. A young reporter stuck in a dead-end job, Anna falls head over heels for an interview subject, the bass player in an up-and-coming alt band. In short order, she pulls up stakes, moves to Las Vegas, gets married and pregnant, and moves into a big fixer-upper haunted by the ghost of a Sin City racketeer. That's when she gets notice from a corrupt casino owner that he's buying up all the properties on her street to make way for a parking lot. But Anna has poured her heart and soul into the house, and digs in hard to fight the system, not the easiest of tasks in a city where bribery, mayhem, and murder are standard operating procedures. Can Anna's tough-guy ghost provide the help she needs to prevail in this dangerous cat-and-mouse game? Will Anna's life be left in ruins? Or worse? Part road trip, part coming-of-age saga, part mystery, part ghost story, The House Always Wins is all Vegas. 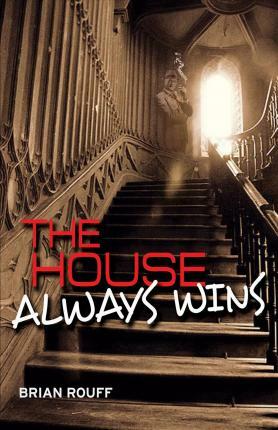 Brian Rouff's latest, The House Always Wins, is a masterful piece that takes the reader down a serpentine path leading to a chilling finish that surprises and delights. Like his other books, it captures the spirit of Las Vegas and keeps the reader in suspense throughout an engrossing story.--Marc David "author of 1,001 Things You Didn't Want to Know "
Brian Rouff knows where the bodies are buried. Born in Detroit and raised in Southern California, Rouff has lived in Las Vegas since 1981, which makes him a long-timer by local standards. When he's not writing articles, screenplays, and Las Vegas-based insider novels such as Dice Angel and Money Shot, he runs Imagine Communications, a marketing and public relations firm in Henderson, Nevada. On a personal note, Brian is married with two daughters and five grandchildren.